There are several places in Australia where you can do some penguin watching tours and Victor Harbour in South Australia is one of them. Other places would be Bicheno in Tasmania or Penguin Island in Victoria. Victor Harbour is a good stopover if you're making your way from Adelaide or Kangaroo Island to Melbourne. The town itself isn't too big and don't hope for a wild nightlife scene but if you're looking for a peaceful place, this is your pick. On the horse tram to Granite.. The Penguin Tours start at night around 9 pm and depart from Granite Island. This island lies in front of the Victor Harbour coast and can be approached by walking over the Victor Harbour bridge. 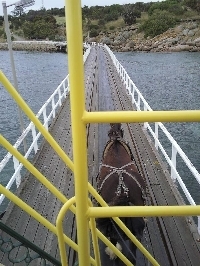 During the day you can also use the old horse tram which runs between Victor Harbour and Granite Island evry 15 minutes. Did you enjoy Penguin Watching Tour in Victor Harbour and have you been on a holiday in Victor Harbour, Australia? Look out for lost penguins!